Red Rover’s new production at 18th and Union, Visiting Cezanne, explores many of the self-destructive as well as sustaining tendencies of artists, using a time traveling setting and plot. This vehicle brings together two discouraged artists and alters history. In reality, at this point in history, Paul Cezanne only knew moderate success, and it was not until in 1907, at a posthumous exhibition, that his well-deserved reputation became established. However, in the play history was changed. 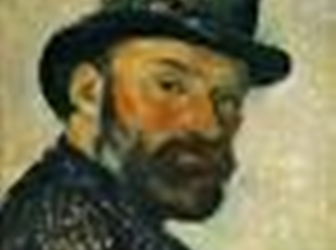 In 2016, at the Metropolitan Museum of Art, Nora Baker learns of an obscure artist named Paul Cezanne, who never became famous, and is only known to a few scholars as an “acquaintance” of the famous Impressionists Renoir, Degas, Pissarro etc. In the end, Nora manages to get back to 2016 with Cezanne’s help, rejuvenates her life and artistic career, with the knowledge she gained from Cezanne, and changes history. Some of the dialogue is rather catchy and there are amusing jokes about new inventions as well as Cezanne’s rants about the “corruption” of the new inventions in Paris (the decadent North of France) which have even invaded the Southern rustic paradise of Provence. I would say that the structure of the play is somewhat rambling and the material is better suited for a screenplay. In the absence of subtitles, the director cleverly used different accents to distinguish when the actors were speaking English to the Americans and when they were speaking French. This added a lot to the play, the accents were spot on, coached by Leah Fishbaugh, clearly French, but clearly understandably in the last row. Bill Johns as Paul Cezanne put in an excellent performance, the costumes by Fawn Bartlett, captured the zeitgeist of the belle-époch and suited every character to a T-. Although it contained both the Metropolitan Museum of Art in New York and Cézanne’s studio in Aix, the set, by Amelia Modlin, worked well enough in the small space under Andrew McGinn’s excellent direction. Visiting Cezanne by Duane Kelly Red Rover Theatre Company, 18th and Union Arts Space, 1406 06 18th Ave, Seattle 98122 ( Central District corner 18th and Union) Fri, Sat 7:30 pm. Sat: 2:00 pm. Til March 31.